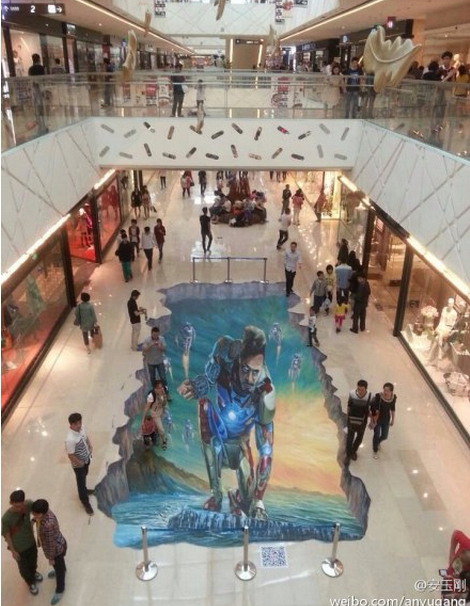 ‘Iron Man 3’ – ‘So Young’ Duel Smashes Chinese Box Office Records. Are Hollywood’s Fortunes Turning? It’s happening so often in China these days that it’s difficult not to sound clichéd, but it was another record-breaking week at the national box office in the 7-day period ending May 5th. So many records toppled that to list them all would fill up an entire column. To avoid making this article an overly long list, I’ll mention just a few. First, at $148 million, last week’s cumulative PRC gross easily beat the all-time weekly record of $136 million that was set during Valentine’s Day week less than three months ago. Although Iron Man 3’s $64 million 5-day gross fell about $10 million short of the all-time single week record that was set by last year’s Titanic 3D at $74.7 million—it did set new records for biggest midnight screenings total with $2.1 million, and biggest opening day with $19 million. So Young, the Vicky Zhao directed romance, notched the biggest second-place weekly gross ever, with $53 million. And The Croods became the highest-grossing original (that is, non-sequel and non-pre-existing franchise) animated film in China’s box office history, with a $36 million total as of Sunday. So all of this is good for China and good for Hollywood, right? Good for China’s producers and distributors, yes. For Hollywood, it’s hard to get too enthused. This past week was a positive blip in what continues to be a confounding and rather distressing trend for American studio films in China. There’s no debating that Iron Man 3 is a solid success. Its PRC gross will roughly double the $60 million gross of the year’s second-best Hollywood release so far, Skyfall, and it will become the first Hollywood film in 12 months to reach $100 million. But it still may not beat So Young, a melodrama from a first-time Chinese director with a production budget that was probably less than 3 percent what Iron Man cost. And So Young won’t even be among China’s top 5 grossers this year. 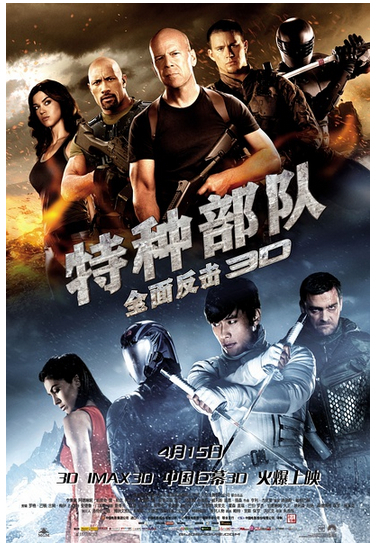 When you consider that Iron Man 3 is the biggest and best that Hollywood has to offer, that it enjoys the backing of a strong local partner in DMG and an unprecedented level of government support, yet it still struggles to beat a low-budget B-level Chinese language movie, you know something’s not working. 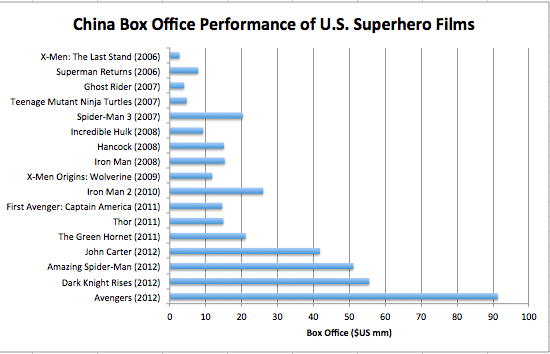 Iron Man didn’t break the downward trend for Hollywood in China, rather, it’s the exception that proves the rule. Chinese audiences like Hollywood movies, but they love Chinese ones. And that’s a major problem for Hollywood. China’s box office is now up 41 percent year-to-date (36 percent in RMB terms) while North America is down by 11 percent. Chinese movies are getting better, and with $50+ million grosses now routine, they’re becoming much more profitable. Capital is attracted to ventures that offer profits, and Chinese movies, though tricky investments in some ways, are looking increasingly attractive. Because Hollywood action movies like Iron Man remain extraordinarily expensive to produce, they need growth from overseas to compensate for their shrinking domestic market. China was supposed to be the solution to Hollywood’s math problem, but China isn’t cooperating. In the global market for film financing, U.S.-based projects are going to find it increasingly difficult to compete, unless they radically change their strategies. 1. Provide animated films and family fare. These genres have repeatedly gotten special dispensations from SARFT, enjoying prime distribution slots even during holidays and blackout periods. 2. Make local Chinese language films for low to moderate budgets. 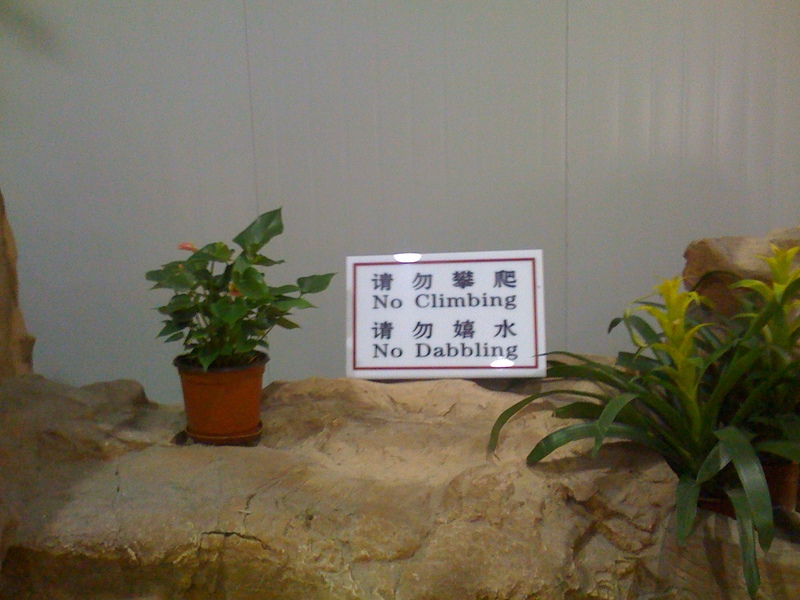 This is not easy, but at least it’s permitted, and as we’ve seen, a well-made Chinese film can generate windfall profits. I didn’t dare say it until now as I’ve been holding my breath for my friends who handled the Chinese production and release of Iron Man 3, but “WOW!” Their picture has just set new PRC revenue and attendance records for midnight screenings with over $2 million, and initial reports indicate it has easily surpassed Transformers 3’s full opening day record of $15 million, with a nearly $20 million haul in its first-day plus midnight receipts. And after so many disappointing PRC releases of Hollywood films in the first quarter, IM3 now appears likely to become the first U.S. film in 12 months, since Titanic 3D last April, to crack $100 million at Chinese multiplexes. I’ve gone on record several times here with the opinion that So Young might beat Iron Man 3 in total China box office revenue. But now it’s a real horse race, and I may wind up eating my words. Barely a year ago it was conventional wisdom that super hero films don’t play in China, because audiences didn’t grow up with the characters and weren’t familiar with their stories. And until recently this was true; the last Iron Man movie grossed only a fraction of what Avatar, Inception, and several Chinese language hits did back in 2010. But Disney and Marvel have worked hard to edify the Chinese audience with films like Captain America, Thor, and especially The Avengers, and together with the invaluable efforts of their Chinese partner DMG they made Iron Man 3’s release into a major cultural event. Despite increasing their initial midnight screen count from 1,500 to over 2,300, there was scarcely a ticket to be had in most theaters, and commentary about the film has lit up China’s social media networks. The China-U.S. collaboration on Iron Man 3 faced numerous challenges and risks, and its success was far from a sure thing, but today’s box office results have vindicated the Disney/Marvel/DMG strategy. Congratulations to all involved for boldly and successfully pioneering new ground in the China-Hollywood relationship. Is $50 Million the New $100 Million for Hollywood Movies in China? At this time a year ago American film producers and distributors had cause to be exuberant about China. The Chinese box office was booming, new theaters were opening at a rapid clip, and the grosses for Hollywood movies were going up, up, up. Whereas a $30 million gross would rank a film among the top 10 releases in China in 2010, in 2011 the top 10 threshold was $40 million, and in early 2012 $60 million became the new benchmark. American films were the primary drivers of this upward trend. China had clearly fallen in love with Hollywood movies, and it seemed reasonable to expect that imported American tent-pole films would continue to ride the swelling box office wave. Pictures like Mission Impossible: Ghost Protocol ($102 million gross) The Avengers ($91 million) and Titanic 3D ($154 million) began fueling the expectation that $100 million totals would soon become routine. In 2013 the wave has continued to roll, but somewhere along the way Hollywood got stuck in the shallows. China’s box office is still booming, and nearly 5,000 new screens have opened in the past 12 months, yet as Chinese language films have leaped ahead to $80 million, $120 million, and even $200 million grosses, American movies have drifted back to 2011 levels, when the Chinese market was half the size it is now. Blame shifting audience tastes, blame government interference if you like, but whatever the reason, Hollywood’s releases in China have had trouble cracking $50 million in 2013. Only two U.S. films have reached that level this year: Skyfall at $60 million, and The Hobbit at barely $50 million. Others will certainly get there—G.I. Joe: Retaliation is a current possible candidate—but few if any will reach the numbers the U.S. studios were aiming or hoping for when they submitted their import applications to SARFT. It’s not entirely clear at this point what Hollywood can do to reverse the trend. Co-productions might be one possible method for Hollywood to recapture market share, but whether China wants co-pros with big U.S. companies anymore is becoming a real issue. 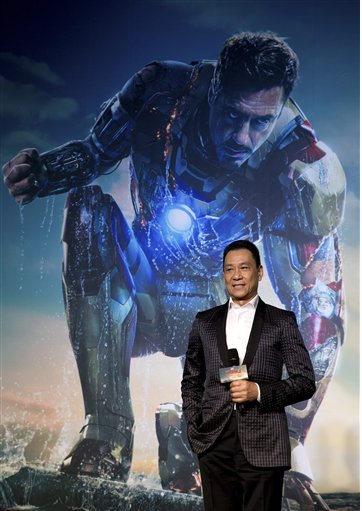 Even while announcements of U.S.-China tie-ups were flooding out of last week’s Beijing Film Festival, SARFT was dithering about whether to allow the biggest U.S.-China film collaboration in history, Iron Man 3, a favorable release date during the upcoming Chinese Labor Day/May Day holiday. If such a major, high profile joint-venture can’t get equal treatment with local movies, then the whole idea of the value of U.S.-China co-productions must be called into question. For only the fourth week out of 16 this year, a Hollywood film carried the top spot in the Chinese box office rankings. G.I. Joe: Retaliation ran up $33 million in its 7-day opening week, a good showing given the above-mentioned lowered expectations for Hollywood films in general. G.I. Joe slowed down considerably on Monday and Tuesday of this week, with less than $4 million over those two days, so it’s still uncertain that it will reach the $50 million mark. Dreamworks Animation’s The Croods opened soft with $6.2 million in its first two days, signaling a probable final gross of less than $20 million. This is consistent with China’s pattern of giving short shrift to original animated features. Mostly it’s the sequels and pre-sold animation franchises like The Smurfs that bring in the big bucks in the PRC. As I had predicted, aggregate national revenue in Week 16 fell short of the total for the same week last year, but not by much, which bodes well for the weeks ahead. Year-to-date box office sales in China surpassed the $1 billion mark last Saturday, more than a month earlier than it reached that milestone last year. It won’t be a surprise if the PRC posts another 40 percent annual increase in 2013. Since Iron Man 3 now looks unlikely to bow on its originally intended April 26th release date, the youth romance So Young should open big on Friday without much competition to impede it. Although a few of my Chinese friends think the film’s melancholy tone will dampen its grosses, most believe the film’s star appeal and excellent early reviews will drive it to blockbuster numbers. Check in later this week for more about So Young. When spring arrives in China, romance blossoms not only between lovers, but also at the multiplex. In 2011 it was Eternal Moment and Don’t Go Breaking My Heart that enticed moviegoers to heart-warming grosses of $31 million (2011’s 8th biggest Chinese language release) and $15 million, respectively. Last year audiences were smitten with Titanic 3D, which seduced them into a hearty $74 million opening week and a lusty ultimate $154 million gross. And this spring, romance has been in bloom for a full month, with Finding Mr. Right leading the box office for three straight weeks (grossing $77 million so far as of Tuesday) before it handed off the torch to A Wedding Invitation (分手合约), which led all comers with a $9.8 million score over the weekend. The Chinese-Korean co-production A Wedding Invitation was directed by Korean comedy master Oh Ki Hwan and stars Eddie Peng (Cold War, Taichi 0) and Bai Baihe (Love is Not Blind) as a pair of star-crossed lovers who, after five years of pursuing divergent lives and careers, finally reunite. Look for Wedding Invitation to gross in the low- to mid-20 millions over the next ten days, until Iron Man 3 grabs many of China’s available screens. In the mean time there’s lots more romance on the way, with four new Chinese language romances and romantic comedies set to open on the mainland in the next week and a half. These include the youth romance Sweet Eighteen, the romantic comedy Lemon, the China/Taiwan co-pro Ripples of Desire, and most significantly, So Young, the highly anticipated directorial debut of actress and pop singer Vicky Zhao. I expect So Young to give Iron Man 3 some stiff competition when the two films open against each other on April 26th. Although action remains China’s most popular film genre, romance has been a steady second best in recent years, holding a 17 percent market share in 2012 and roughly the same so far in 2013. Domestic Chinese romances and romantic comedies have been especially potent this year, and because these films are inexpensive and logistically easier to produce than action movies, and because films like Finding Mr. Right are making enormous profits, we can look for many more such pictures to come. Chinese language titles once again dominated the box office, taking the top four spots in the rankings and nabbing an 89 percent market share for the week. American movies now hold a mere 23 percent share of mainland ticket revenues for the year, a disastrous drop from the 57 percent share they held at this point last year. Weekly box office nationwide totaled $48 million, down by 43 percent compared to the same week last year, when the juggernaut Titanic 3D swept through China’s cinemas. The week ahead will also be down compared with last year, and then after the massive Titanic comps are out of the way, China’s upward year-on-year trend should continue. China’s year-to-date aggregate box office revenue in 2013 is 44 percent ahead of 2012. Hollywood’s studios can only hope that their upcoming releases perform better than their films that are currently playing. The only U.S. picture to index well so far this year is A Good Day to Die Hard, which will end its run with $31 million, a total that is impressive only when compared to its weak results in the rest of the world. Oz the Great and Powerful will probably wind up at less than $30 million, and Jack the Giant Slayer will finish up at around $9 million. Whereas U.S. distributors must have been hoping for several $100+ million releases in China this year, the way things are going most of their pictures will be lucky to reach even half that amount.